The Algae growing as planktons, benthos, epiphytes and in other common aquatic habitats provide a major source of food to small fishes, aquatic amphibians, and other animals. Since man is dependent on fishes to supplement his diet, the algae prove to be a very important indirect source of human food. 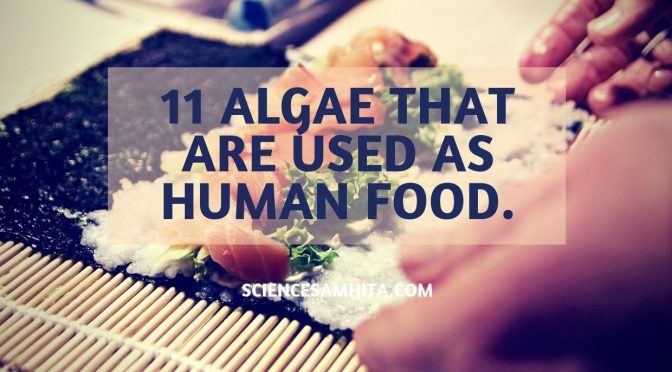 The practice of direct consumption of algae as human food is also present around the world. A list of more than hundred species can be made which provide direct food to the human beings, especially to the coastal people of the world. Chlorella is a unicellular alga which possesses a very high quality of food value. It is high in protein and other essential nutrients; when dried, it is about 45% protein, 20% fat, 20% carbohydrate, 5% fiber, and 10% minerals and vitamins. Recently, chlorella is being tried on mass scale culturing for human consumption. It is used as diet food, as it provides the highest levels of dietary nucleic acids in all foods. Dietary nucleic acids (e.g., RNA) are now recognized as powerful, natural substances that provide super nutrition, rejuvenate, heal, and help create optimum health. Researchers who’ve studied chlorella extensively say it’s nature’s “Perfect Food” (in fact, NASA studied it as a food for astronauts). Porphyra is a cold water seaweed that grows in cold, shallow seawater. It has 30-35% proteins, 40-45% carbohydrates and a very high percentage of vitamins. In East Asia, it is used to produce the sea vegetable products such as “amanori” in Japan. The common preparation is known as “Asakusa nori” (Japanese), Zakai, gim (Korean) and zicai (Chinese). The alga is sold and eaten together with rice. Most human cultures with access to Porphyra use it as a food or somehow in the diet, making it perhaps the most domesticated of the marine algae. There are considered to be 60 to 70 species of Porphyra worldwide and seven around Britain and Ireland where it has been traditionally used to produce edible sea vegetables on the Irish Sea coast. It is a red alga (Rhodophyta) and also called dulse, red dulse or sea lettuce flakes. It grows on the northern coasts of the Atlantic and Pacific Oceans. Dulse is a good source of minerals, being very high in iron and containing all the trace elements needed in human nutrition. Its vitamin content is also much higher than a vegetable such as spinach. It has high protein content (more than 20%) but lacks the essential amino acid b.
Dulse is a well-known snack food. In Nova Scotia and Maine, dried dulse is often served as a salty cocktail snack in bars. It is eaten raw in Ireland, like chewing tobacco, or is cooked with potatoes, in soups, and fish dishes. In present-day cuisine, dulse can be incorporated into bread, fish dishes, fish and vegetable soups, toasted and eaten as a snack, or fried crisp as a substitute for fried bacon. Laminaria is a kelp that finds its place in the brown algae family. Laminarian species contain about 10% protein, 2% fat, and useful amounts of minerals and vitamins, though generally lower than those found in “nori”. The mineral constituents of Laminaria include iodine, potassium, magnesium, calcium, and iron. The alga is commonly cultivated and grown on stones, cylinders, and ropes. Laminaria species yields a food product known as “Kombu” or “Konbu”. Kombu is used extensively in Japanese cuisines as one of the three main ingredients needed to make dashi, a soup stock. It is also sold dried or pickled in vinegar. Also Read: What is Eutrophication? What are its Causes & Effects? Alaria is a genus of brown alga comprising approximately 17 species. Members of the genus are dried and eaten as a food in Western Europe, China, Korea, Japan, and South America. Alaria yields a product known as “Sarumen” in Japan. Alaria esculenta, in particular, is an excellent source of protein and iodine. Nostoc is a genus of cyanobacteria found in various environments that form colonies composed of filaments in a gelatinous sheath. Containing protein and vitamin C, Nostoc species are cultivated and consumed as a foodstuff, primarily in Asia. Balls of Nostoc (terrestrial species) are collected, boiled and consumed as food by the Chinese and the South Americans. Monostroma occurs naturally in the bays and gulfs of southern areas of Japan. It is a flat, leafy plant and only one cell thick. It contains 20% protein on average and has a useful vitamin and mineral content. The seaweed is washed well post-harvest. It is then either processed into sheets and dried, or simply dried and then boiled with sugar, soy sauce, and other ingredients to make “nori-jam”. Sea lettuce is a thin, green seaweed, a species of Ulva. It is collected from the wild and sometimes added to Monostroma, Enteromorpha sp. to create a food product called “aonori”, which enhances the taste of warm dishes like rice, soups, and salads. It has a higher protein content than the other two and is rich in iron. Ulva lactuca was formerly used in salad and soups in Scotland. Enteromorpha is cultivated and found in bays and river mouths around Japan. They are also found in many other parts of the world, including Europe and North America. They contain about 20% protein and are low in fat and sodium and high in iron and calcium. The seaweed can be lightly toasted to improve the flavor and powdered for use as a condiment on soups and foods, or it can be crushed into small pieces and used as a garnish. Caulerpa racemosa is a species of edible green alga and is commonly known as sea grapes. It is found in many areas of shallow sea around the world. It is consumed widely in salads in Japan, Fiji, the Philippines, and Thailand. Caulerpa is also eaten by local fishermen in Malaysia and Indonesia. This alga is rich in fiber, proteins, minerals (calcium and magnesium), folic acid, ascorbic acid, vitamin A, and vitamin B1 while also being low in fat. It is a large, robust bull kelp species and the dominant seaweed in southern New Zealand and Chile. In Chilean cuisine, the stem and holdfast of Durvillaea, known as hulte is used for different recipes, like salads and stews. The Mapuche indigenous people refer to it as collofe. Tiwari, B. and Troy, D. (2015). Seaweed Sustainability. London: Academic Press. Previous PostHow do Auxins affect Plant growth?Next Post11 Amazing Facts about DNA You didn’t Know.